Nutrition is one of the most important aspects that we must look after, but we also have to control that all the other organs work properly. The dog's eyes are very sensitive and require daily care. In small breeds, the tear conducts frequently become clogged up and as a consequence they secrete tears which cause the hair around the eyes to loss color. The cornea is the primary membrane that is in contact with the air. In case of irritation this will develop a sickness. The conjunctive is the mucous that covers the interior of the eye lids. If it becomes irritated this will develop red eye. The crystalline, a transparent lens, can become opaque and develop cataracts. The iris gives the eye color. In the retina, the most inner part of the eye is where images are formed. The tear canals go from the internal angle of the eye until the nostrils. The dog has a third eye lid. The owner will limit himself to cleaning the external part, without touching the cornea, the conjunctive or the sides of the eyes. Hygiene: The only products that can be used are specific eye drops for dogs or physiological serum. In order to prevent the ant esthetic effect of the tears it is convenient to clean the eyes every day with gauze that has been moisturized with an ocular antiseptic; it is better if we don't use cotton because it leaves filaments behind. In order to clean the eye we must proceed from the inner angle, the angle of the nose to the external angle, in order to keep the eye clean. In the case of an infection, before we apply the product it is convenient to clean the eye: cleaning the eye will help the eye drops work more efficiently. Using a product made for dogs we will not have to worry about any type of irritation. The Pathological Spill: Any ocular secretion that is not clear should be a reason to take the dog to the vet. The tears are produced permanently, but without a spill because it is evacuated through the nostrils. 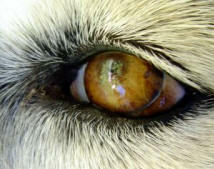 If the spill is clear, it is normally because of infection to the tear conducts, especially in the smaller dog breeds. The Obstruction of the Conducts: The tear apparatus is made up by the tear glands and conducts. The most common problem is the obstruction of these conducts and rarely an infection. It is common in some dogs of small breeds. The leak of the eye in the internal angle usually takes the color away from the hair around the eyes. This happens because the liquid cannot evacuate normally through the conduct, so it leaves the eyes through the side. Regular hygiene allows us to limit the problem. The tear conducts can be cleaned by giving the puppy anesthesia. The Infections to the Conducts: These are due to the fact that a small thorn has been dragged into the angle of the eye; it has gone inside the conduct and has gotten infected. Next to the nozzle we can see a hot and painful infection, this will require an incision. In this case there is a great leak. We must always consult a physician.